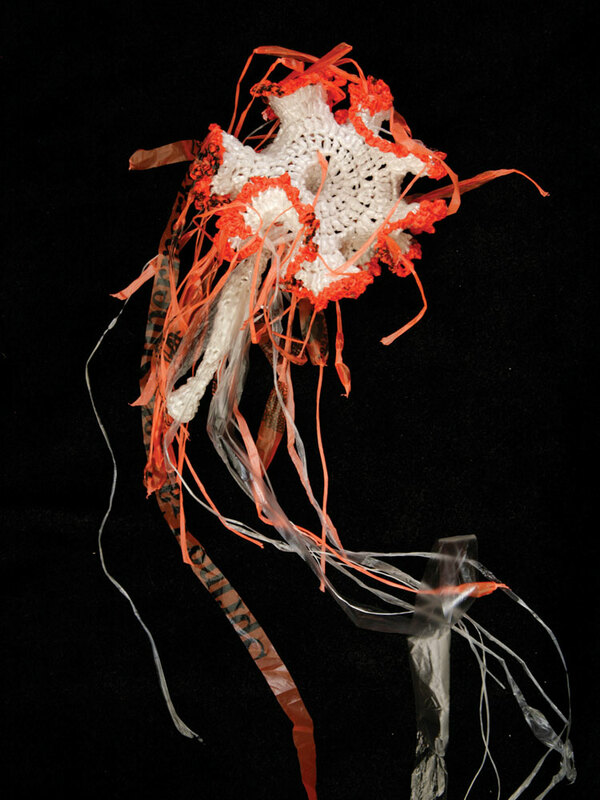 Margret Wertheim made this hyperbolic jellyfish with plastic trash-can liners. A huge installation of crocheted coral is engaging visitors in a project where, math, science, and handcraft converge. A fiber art project launched in 2005 in the living room of two sisters has spread around the world and taken root at the Smithsonian. 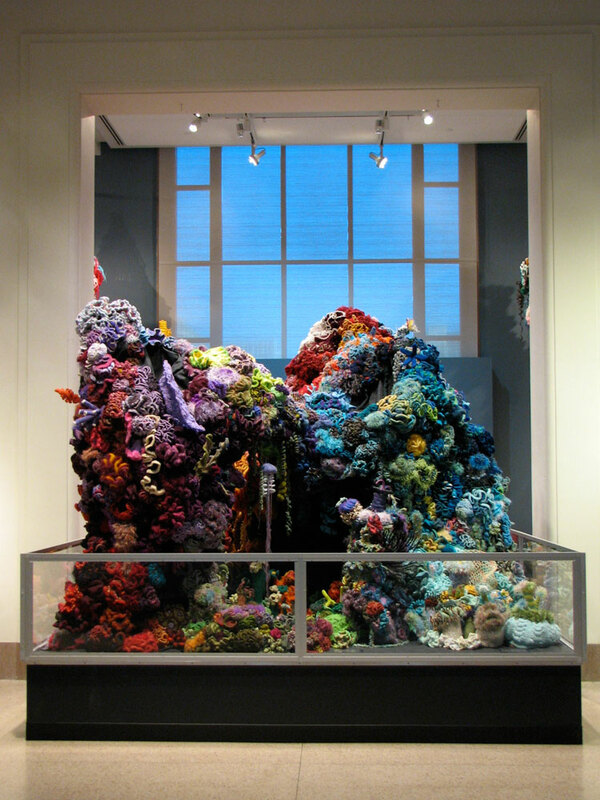 The burgeoning "Hyperbolic Crochet Coral Reef" and Smithsonian Community Reef - the project's latest satellite reef - are on exhibit at the National Museum of Natural History in Washington, D.C., through April 24. 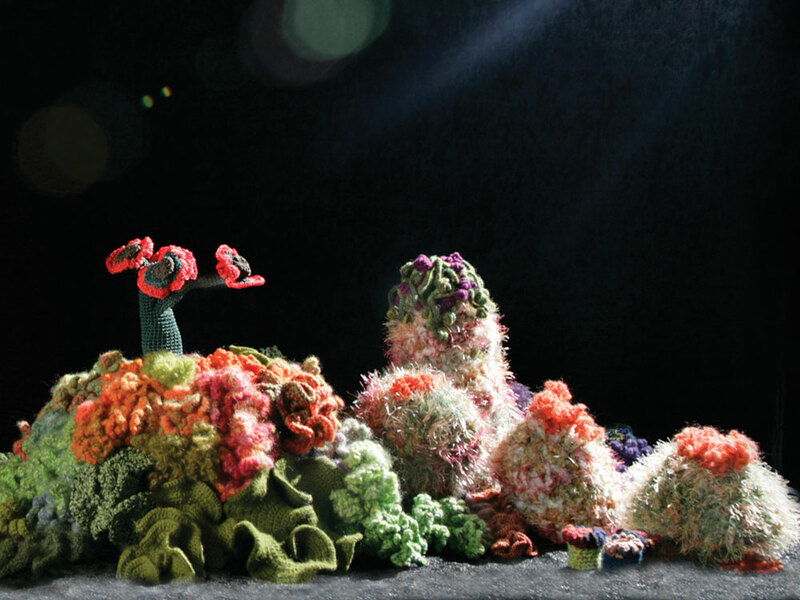 Ultimately, the thousands of crochet organisms that comprise the two reefs may raise awareness to protect the real, endangered reefs on the ocean floor. Twin sisters Margaret and Christine Wertheim began their mammoth craft undertaking as an initiative of their Los Angeles-based Institute For Figuring (IFF). Margaret, a science writer, and Christine, a California Institute of the Arts professor, became fascinated by the work of Cornell University mathematician Daina Taimina. An ardent crafter since her Latvian childhood, Taimina discovered in 1997 that hyperbolic space could be physically modeled through crocheted forms. ("Hyperbolic space" is a term from non-Euclidean geometry; a hyperbolic plane is a surface in which the space curves away from itself at every point.) Taimina's mathematically pure, ruffled structures reminded the Australian-born sisters of the curly coral creatures that form the Great Barrier Reef. Christine and Margaret then re-interpreted Taimina's academically prescribed shapes into a multifarious crocheted reef. For two years, piles of crocheted "coral" accumulated in nearly every room of the sisters' Craftsman-era home, before they even announced the project on the IFF website. When they did, they not only attracted the interest of the Andy Warhol Museum in Pittsburgh - the reef was included in a 2007 exhibit on global warming - but also drew contributors from around the globe. Today, the Wertheims' website acknowledges the more than 75 crafters who crocheted coral for the IFF Core Reef, as well as the work of the thousands who have contributed to satellite reef projects. From the beginning, the human-made reef was envisioned as a communal art venture that could raise awareness of the ecological impact of global warming, ocean acidification, invasive species, and overfishing on coral reefs. But the sisters never imagined the myriad ways the project (discussed in the Dec./Jan. 2008 American Craft) would grow. The past six years have seen a flurry of activity around the world: The IFF Core Reef has been exhibited in 11 museums and galleries, and some 20 satellite reefs have sprung up in New York, Florida, Illinois, and Arizona, as well more far-flung places such as England, Ireland, Latvia, Australia, and South Africa. Along the way, there have been a number of reef-inspired school projects, more than a dozen workshops, and four lectures and symposia - including a 2009 talk in Ireland by Margaret at the fashionable TED (Tech­nology, Entertainment, Design) conference. The project has attracted hundreds of thousands of exhibition visitors. What has drawn such widespread fascination? Most likely it's the unusual intersection of art, science, mathematics, handcraft, conservation, and community. Made from traditional yarns, as well as such unexpected materials as plastics, soda can tabs, and cable ties, the crocheted pieces represent a wide-ranging catalog of sea creatures - corals, sea slugs, kelp, and sponges among them. 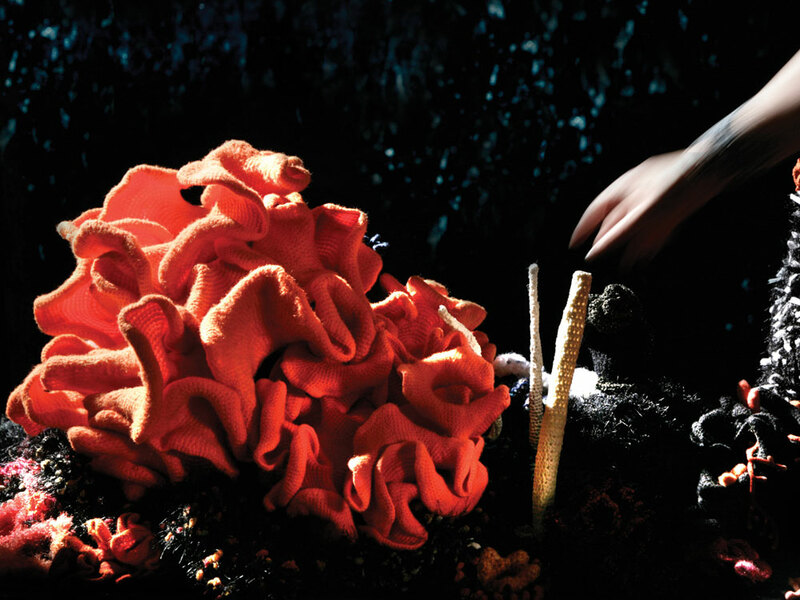 The handmade reefs tell the story of ocean life in all its exquisite beauty - and precariousness. Nancy Knowlton, Sant Chair for Marine Science at the National Museum of Natural History, and science advisor for the Smith­sonian exhibition, is acutely aware of the dangers to these delicate ecosystems. "The reefs I studied 35 years ago have largely vanished," she notes. "And most reefs may well be gone by the end of the century or sooner, if nothing is done to protect them." If trends continue, she says, "an exhibit like this may someday be the only way for people to experience the beauty of coral reefs." Beauty is not all that these living organisms provide, of course. Rick MacPherson of the Coral Reef Alliance points out that while coral reefs cover just two-tenths of one percent of the ocean floor, their complex tropical ecosystems rival the rainforests in biodiversity, supporting almost a quarter of all marine species. Coral reefs also provide food, resources for medicines, and "income to millions of people worldwide, and they protect our coastal communities from damaging storms and tsunamis," MacPherson says. Among the greatest threats to the well-being of reefs globally are ocean acidification and ocean warming, coral bleaching, water pollution and sedimentation, and ozone depletion. The Wertheims have illustrated these concerns in their largely colorless Bleached Reef and Bleached Bone Reef. Other destructive practices include coral mining, coastal development, and careless tourism, alluded to by the sisters' Toxic Reef, which is almost wholly constructed from trash and plastics. The idea for the Smithsonian Community Reef took root when the National Museum of Natural History agreed to exhibit the IFF Core Reef collection. Barbara Stauffer, chief of temporary exhibitions at the NMNH, started by asking Jane Milosch, former curator of the Renwick Gallery, to co-curate the project with Knowlton. Stauffer also enlisted Milosch to help her build a team of organizers for the project and secure funding, leading to sponsorships from the Coral Reef Alliance, the Quiksilver Foundation, and the Australian embassy. Museum programming coordinator Jennifer Lindsay, a former environmental legal assistant, a craft scholar, and a longtime knitter with deep connections within the greater D.C. fiber arts communities, headed the six-month community reef project. She rallied some 800 participants - ages 3 to 101, from some 25 states and three countries - to produce nearly 4,000 pieces of crocheted coral. The show's designers then assembled the pieces - in a kaleidoscope of shapes and colors, as individual as the makers - into a 15- by 9- by 7-foot crocheted reef mound. The result is an exhibition that Margaret Wertheim describes as "the apotheosis of the project - a dream come true." 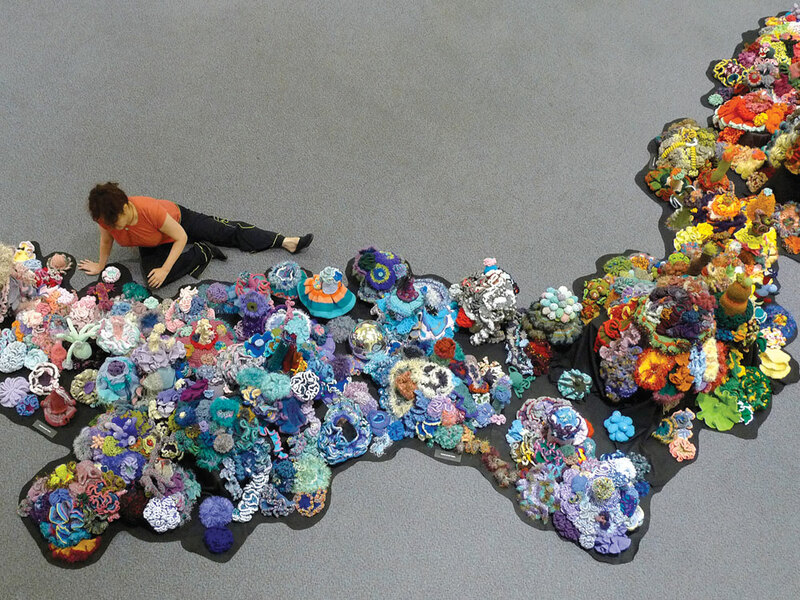 With no end in sight for this ever-evolving endeavor, the "Hyperbolic Crochet Coral Reef" exhibitions and satellite reefs will continue to raise awareness about the surprisingly related interests of crafters, mathematicians, and environmentalists. Tara Leigh Tappert is an independent scholar and archivist based in Washington, D.C. Her latest project is a study of how the U.S. military has used arts and crafts for rehabilitation and recreation since World War I. Another section of the ring-shaped Ladies Silurian Atoll, made by a core group of crafters. Christine Wertheim curates The People's Reef in Scottsdale, Arizona. Detail from The Ladies Silurian Atoll, a piece of the "Hyperbolic Crochet Coral Reef." The Smithsonian Community Reef. Photo: Courtesey of the Smithsonian Institution. Incorporating shells, bones, and other ephemera washed up by the ocean, renowned fiber artist Kay Sekimachi creates jewelry born on the beach. Textiles legend Sheila Hicks has never stopped traveling the world and seeking new horizons in her work. Lizz Wasserman left behind a career as a mass-market clothing designer to launch her Popomomo line.